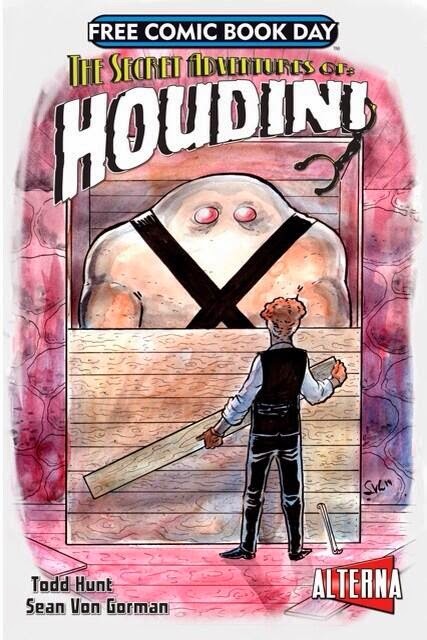 Share in the highly anticipated return of Harry Houdini this Free Comic Book Day, 2014. The story of illusionist and escape artist Harry Houdini returns to life as illustrator Sean Von Gorman and writer Todd Hunt introduce the newest, bite sized, installment of The Secret Adventures of Houdini graphic novel series. Discover another untold story from the final years of Harry Houdini’s life as his connection to the “Golem of Prague” is revealed. In this free offering for Free Comic Book Day 2014, witness how the “Golem of Prague” connects the final moments of Harry Houdini’s last adventure to his thrilling return. Travel back to a world of magic and mystery as another piece of Houdini’s secret past leads up to his newest adventure and continue the story when The Secret Adventures of Houdini – Book Two is released in the fall of 2014 through ALTERNA Comics. This special free issue can be downloaded now at www.comixology.com. Free Comic Book Day is held the first Saturday in May each year. Visit the Free Comic Book Day website for more information and to get a list of participating stores in your area. You can buy The Secret Adventures of Houdini, Book 1 on Amazon. For more information on the series, check out the official website.